If you speak Cantonese, by now you have must have watched it at least once or possibly more times. You must have shared the link with your family and friends and urged them to watch it too. If asked, you can probably quote a few zingers from it verbatim. I am referring to the anti-government tirade by Kwan Wing-yi (關穎怡), a self-described “concerned citizen,” at a special Legco meeting to discuss retirement protection earlier this week. The video went viral on social media, receiving 300,000 views on YouTube in just 48 hours. Netizens have added English subtitles, turned her words into a rap song, and even called on her to run for Legco in the September general election. For those who haven’t had the pleasure of viewing – or understanding – the Cantonese-only clip, here’s a recap of Kwan’s three-minute rant. Your so-called ‘universal’ retirement plan puts an $80,000 asset limit on applicants but only offers them a paltry payment of $3,230 per month. Are you kidding me? There is so much government-business collusion and inflation these days that we can’t even buy a catty of contaminated vegetable for $30? People like [Labour and Welfare] Secretary Matthew Cheung (張建宗), who makes $300,000 a month, have no idea how much we struggle to make ends meet, or else he wouldn’t have made the callous, cold-blooded remark that $16,000 is a very decent income [for a two-person household]. Chief Secretary Carrie Lam (林鄭月娥) rejected the need-blind proposal [favored by the public] because she claimed it would lead to a government deficit. What she said made me laugh out loud! The government spent hundreds of billions of taxpayer dollars on white elephant projects like the Hong Kong-Zhuhai-Macau Bridge and the high-speed rail link, only to nickel and dime the poor on social programs. How dare she mention the word deficit! Pardon my language, but these corrupt bureaucrats are worse than thieves! Hands off our money, old hag! What happened to C.Y. Leung after he accepted $50 million in secret payments? Nothing. What happened to the seven police officers after they beat up a citizen in a back alley? Nothing. [...] What happened to the pro-Beijing camp after it blatantly rigged the district elections? Nothing! In our topsy-turvy city, firing shots into the air is considered compliant with police protocol. 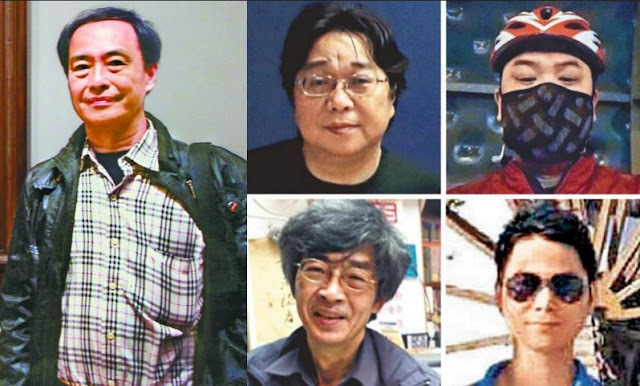 The ethical standards for the government and the police are as ‘flexible’ as the arm of the officer who hit passersby with his baton and called it an ‘extension of his arm.’ Lawmakers are permitted to spread unfounded rumors in Legco, like the one about one of the abducted booksellers taking a speedboat to China to procure prostitution. To be honest, I am worried that after making this speech today I too may disappear and ‘go to the mainland using my own methods.’ [Kwan was again referring to the missing booksellers who had presumably entered China without proper documentation]. Why bother with retirement protection when our personal security is unprotected? Since taking his job, C.Y. 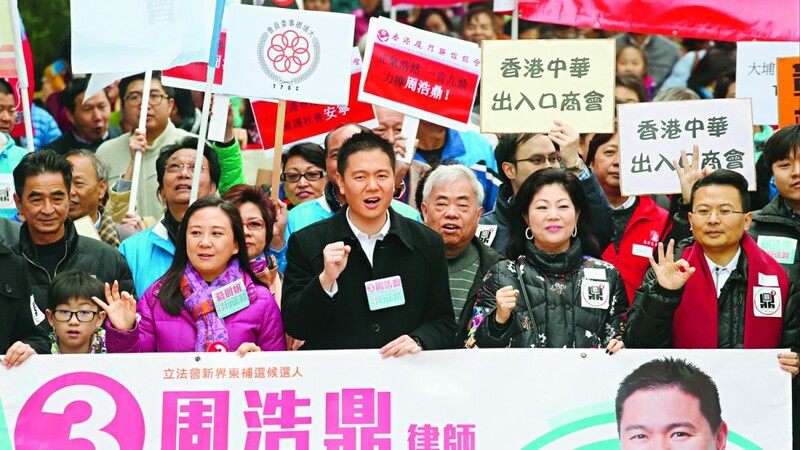 Leung has lost his conscience – then again, maybe he never had one to begin with. I want to offer Leung, his senior staff and the Hong Kong Police a piece of advice: there is something called karma in this world. There isn’t much we can do to stop you now, but future generations of Hong Kongers will be watching you. Your karma will catch up with you one day! As soon as Kwan’s speaking time was up, the meeting’s chairman switched off her microphone to stop her from spewing more anti-government venom. But the damage was already done. Her harangue was uploaded to YouTube within minutes and was held up in the echo chamber of the Internet as the ultimate indictment of C.Y. Leung’s failed administration. Kwan became an overnight social media sensation, all for venting frustrations that so many others have failed to put into words. Netizens credited her success to her well-chosen tone. She delivered the sort of angry wife scolding based on logic understood by ordinary citizens, with none of the abstruse political speak preferred by the traditional pan-dems. 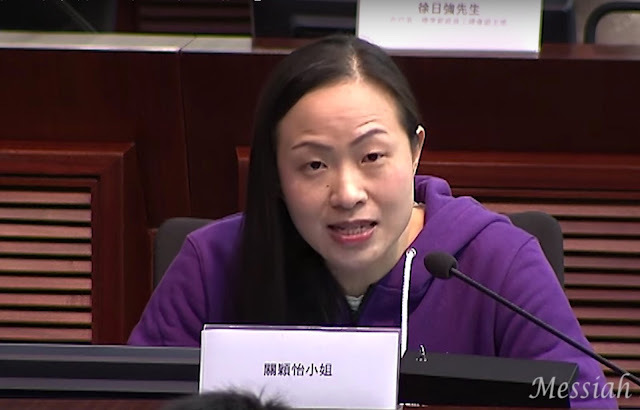 Even a “C9” (師奶) – an unsophisticated housewife in the local vernacular – is able to grasp the convoluted political issues covered in her speech. But perhaps it is who she is that has made her tongue-lashing so powerful. Kwan has no discernible political affiliation or agenda. She has no constituent to please or ideology to preach. She is, it seems, just a fed-up citizen who is tired of being a passive bystander and has to blurt out the truth, like the child in The Emperor’s New Clothes. By calling out the government in a simple, relatable way, Kwan might have changed more minds in a few days than any of the slogan-shouting pan-dems or brick-throwing localists have in years. Gong chu (港豬), which literally means a Hong Kong pig, is a popular Cantonese catchphrase to describe citizens who choose a steady livelihood over civil liberties, or those who are thankful for economic handouts from Beijing despite having their freedoms gradually taken away. 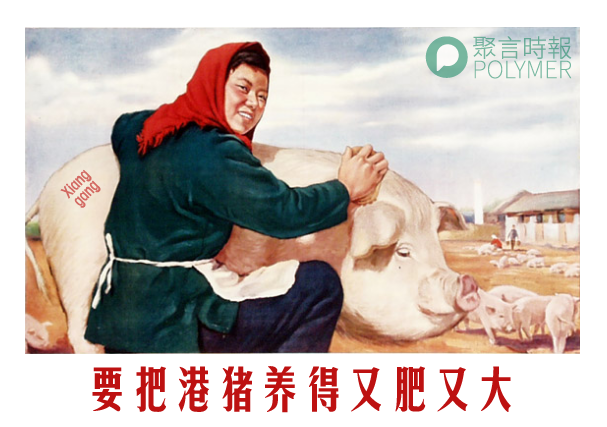 Kwan’s refusal to be a docile farm animal is a testament to the long-term impact of the occupy movement, which put citizens through a kind of social awakening not experienced since the Tiananmen Square Protests. Impressive as it was, Kwan’s Legco appearance has not been universally praised. Criticisms are coming from both ends of the political spectrum: the moderates found her rhetoric too aggressive, while the radicals said it wasn’t nearly aggressive enough. The latter group, comprising mainly localists, took particular issue with her reliance on karma as a form of political comeuppance. To them, the Buddhist belief in retribution is just a self-deluding old wife’s tale to make the oppressed feel better about their plight when they lack the courage to take real action to change it. Karma won’t stop bad governments from doing bad things, the localists sneer – only a revolution will. If there is a moral in this story, it is that to counter the ruling elite’s growing impunity, the opposition needs all the help it can get. The pan-dem lawmakers will push back government officials in Legco debates, the radicals will resist riot police in street protests, and ordinary citizens like Kwan will use their sharp tongues to engage and educate the masses in every day dialogues. They will each do their part and give what they can, instead of constantly ripping into each other and bickering over whose method is the only way forward. As the city heads into an election weekend where two opposition candidates are siphoning off votes from each other and effectively handing the victory to the other side, citizens are well-served to remember the fortune cookie wisdom that we are stronger together than apart. 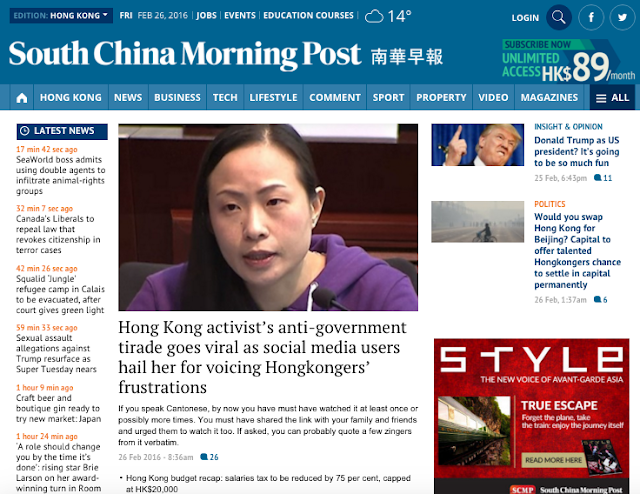 This article was published in the South China Morning Post under the title "Hong Kong activist's anti-government tirade goes viral as social media users hail her for voicing Hong Kongers' frustrations."